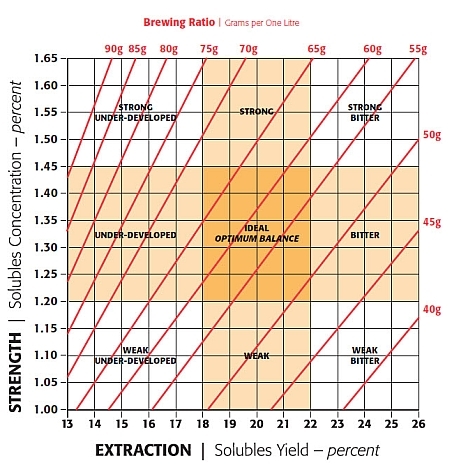 The idea here is that coffee will taste radically different depending on how concentrated (i.e., its "strength" or solubility level, gauged on the vertical axis, and often expressed as "TDS" for total dissolved solubles), and how more or less efficiently it has been brewed at whatever strength level it finds itself on (known often as "extraction yield," or "extraction percentage," on the horizontal axis). So, for example, a coffee that has way too much water to coffee in the mix will plot pretty low on the vertical axis of the chart above (i.e., it's "strength" will be very low). The plot point on the horizontal axis, however, can be manipulated somewhat, say, by grinding fairly finely and/or letting coffee and brew water hang out a lot longer, letting the increased surface area more efficiently extract more stuff. This has the effect of boosting the plot point farther to the right on the horizontal axis. The chart above gives some descriptor words for how a typical brewed coffee might taste if its data points plotted in a certain region of the chart. A device known as a refractometer helps us in this task by giving us a reliable reading of suspended solids (in our case, coffee solubles) using light refraction, and converting that into a usable number, expressed in TDS. That TDS number can be plotted directly onto the vertical Brew Chart axis. We can then plug in the TDS into a simple equation to help us plot our Extraction Percentage number along the horizontal axis. And voila! Now we have a bit of a visual map of how a coffee might "taste." (It doesn't really tell you how it tastes, but for the purposes of our semi-glossed-over blog post it is an acceptable stand-in. But that's another story for another time.) It's a basic look at a fairly complex concept. But it's all we have had for years and years in the coffee industry. Atago makes a simple, easy to use and relatively inexpensive refractometer geared toward use with coffee. 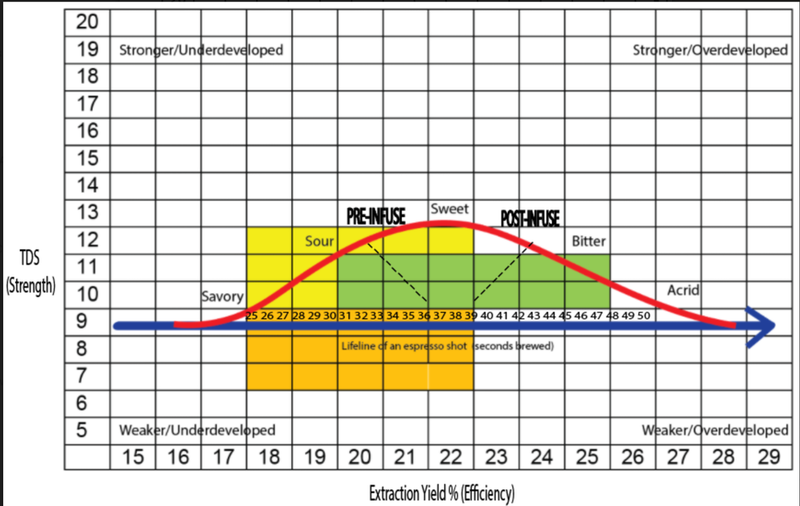 Basically, just take the standard Brew Control Chart; highlight some repeatable taste-target regions; then linearize and bellcurveify it with a time factor underpinning it and you've got a decent rough draft of one way to visually conceive of how espresso behaves, as well as how we might begin to consistitize its execution. There's quite a lot going on in this new chart, including expressions for pre-infusion and post-infusion (another story for another time). But the main idea should still be fairly self-explanatory. At any rate, it's very much a work in progress; and I would welcome any thoughtful expressions of how to improve or clarify or complexify it.